Lobbyists Reported Spending Nearly $40 Million in Michigan Last Year. It's A Total That Breaks The Previous Record Set Just One Year Ago. LANSING — As it became clear the Michigan Legislature would vote on an overhaul of state energy laws in the last days of 2016, the calls and emails to then-Rep. Bill LaVoy multiplied, he remembers. LaVoy, who’s from Monroe, was the top Democrat on the House Energy Policy Committee. With Republicans divided on the energy legislation, support from Democrats, like LaVoy, was key. And LaVoy’s phone was busy. There were calls from other lawmakers. There were calls from policy staffers. And there were calls from lobbyists. 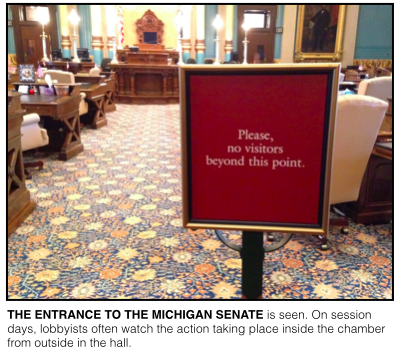 In the summer of 2016, the Michigan Campaign Finance Network tallied more than 100 registered lobbyists having weighed in on the bills in committee hearings. “It was crazy,” LaVoy says of the number of contacts he received in the days leading up to the final votes on Dec. 15. The energy proposals were two of the most lobbied bills of 2016, a year that saw more spending on lobbying than any year before, according to filings with the Michigan Secretary of State’s Office. Lobbyists reported spending $39.99 million in Michigan in 2016. The previous high came the year before in 2015 when lobbyists reported spending $38.66 million. The 2016 total is 3.4 percent greater than the 2015 total. 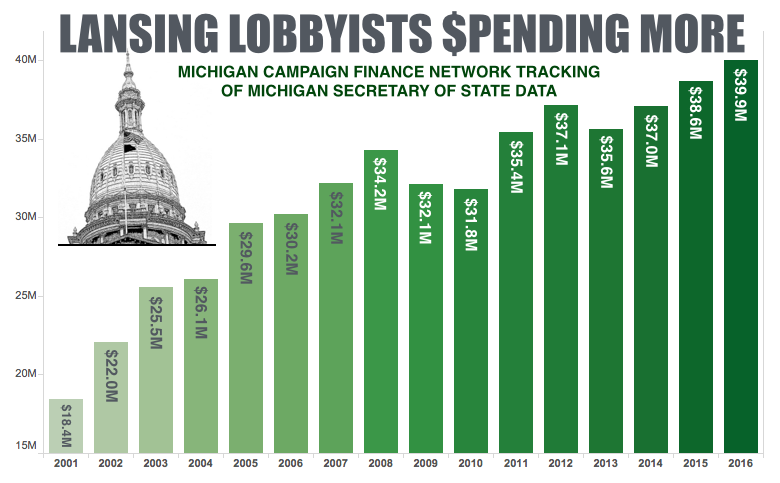 Lobbyist spending has been trending upward in Michigan for many years. In 2006, lobbyists reported spending $30.20 million. In 2010, the year Gov. Rick Snyder was first elected, lobbyists reported spending $31.83 million. 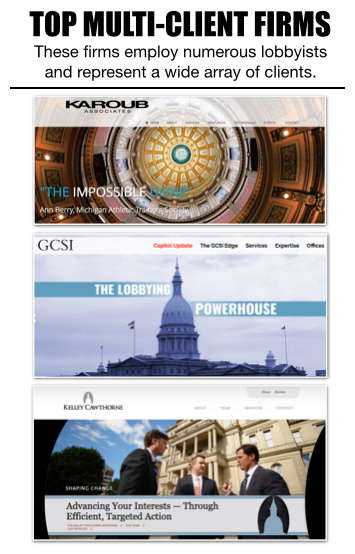 As a candidate in 2010, Snyder’s campaign issued a policy plan that was critical of the growing influence of lobbyists in Lansing. “Michigan’s citizens deserve improved disclosure to assess the extent and nature of how lobbyists influence public policy,” the document said. The spending total from Michigan lobbyists for 2016 — Snyder’s sixth year in office — is up 25 percent over the 2010 total. And still, lobbyists report on their spending only twice a year and they can avoid disclosing whom they're buying meals and trips for as long as the spending totals remain under certain thresholds. With the state under one-party control since 2011, which can make it easier for outside groups to achieve policy changes, lobbyists have increased their activity in Michigan. Their spending increases have outpaced the inflation rate and have run counter to what’s been happening with the federal government. Spending on lobbying at federal level, which has seen divided government, has generally decreased since 2010. What’s Driving The Increased Spending in Michigan? The biggest spenders on lobbying in Michigan are multi-client firms that represent a wide array of interest groups. Their spending has trended upward for years. Couple that trend with increased spending by groups that do their own lobbying and new groups taking an interest in the Michigan Legislature, the overall spending total for the state has jumped upward. 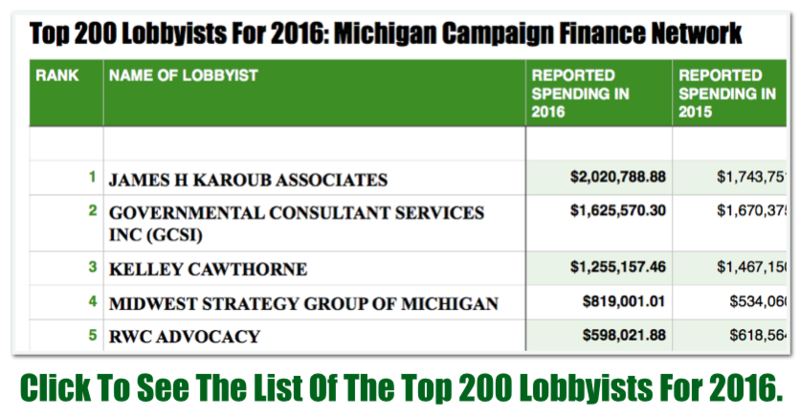 The top six spenders for 2016 in Michigan were all multi-client firms (a list of the top 200 lobbyists for 2016 is available here). Combined, the top six firms reported spending $6.9 million in 2016. In 2015, those same six firms reported spending $6.6 million. The increase is about 4.5 percent, similar to the overall spending increase over that period. The multi-client firms work on all types of policy matters, and because of Michigan’s lax transparency laws, it’s impossible to tell how much the firms spend on lobbying specific pieces of legislation. However, according to lawmakers who were the subjects of the lobbying, the firms were busy when it came to the energy legislation in 2016. The three largest multi-client firms all list one of the state’s dominant electric utilities as clients. James H. Karoub Associates (No. 1 at $2.0 million) and Kelley Cawthorne (No. 3 at $1.2 million) both work with DTE Energy, according to their disclosures. Consumers Energy employs Governmental Consultant Services Inc. (No. 2 at $1.6 million), according to the disclosures. The fourth largest multi-client firm for 2016, Midwest Strategy Group ($819,001), disclosed working with the Michigan Environmental Council and the Alliance for Solar Choice, both of which sought to influence the energy legislation. In addition to the multi-client firms, companies and interest groups can do their own lobbying, which ebbs and flows with the policy debates happening in the Legislature. DTE Energy, for instance, reported spending $365,930 on in-house lobbying in 2016, up slightly over its previous record total, $361,242 in 2015. According to its disclosure, DTE has 24 employees or firms actively registered to lobby on its behalf. Exelon, which describes itself as a power generation company, was one of the groups that hiked its spending on lobbying in Michigan in 2016, spending $78,000, an increase of more than 300 percent over the previous year. In 2015, it reported spending only $18,336. A wide array of other interest groups attempted to influence the energy legislation, including the Michigan Chamber of Commerce, school associations, individual corporations, labor groups and environmental organizations. But again, it’s impossible to tell how much of their spending was focused on the energy bills. LaVoy, who served two terms in the Legislature before losing his re-election bid in 2016, said he “definitely” received more lobbying over the energy proposals than any other subject in his career. LaVoy said lobbyists helped provide lawmakers with information about the complex energy bills. “The best way to understand an issue is to find a lobbyist on each side of the issue,” LaVoy said. LaVoy who represented an area with a coal plant and a nuclear plant, ended up voting for the energy package because of its encouragement of Michigan-based power generation, he said. The vote was about creating jobs, LaVoy argued. LaVoy and the rest of the Legislature sent two wide-ranging energy bills — 234 pages in total length — to Snyder on Dec 15. Snyder signed the bills and called them “landmark” reforms. Former Rep. Ed McBroom, a Republican from Vulcan, was one of the lawmakers who voted against the energy bills, which he criticized for not doing enough for the Upper Peninsula. In the debate over energy, McBroom, like LaVoy, said lobbyists helped inform members. McBroom added that interest groups also helped keep both sides of the debate entrenched for a long time as it wasn't until the end of the 2015-2016 session when bills cleared the Legislature. For McBroom, who served six years in the House, the energy bills brought more lobbying than many other issues but not the most overall. The most lobbying he received, he said, was over telecommunications reforms in 2011. Former chair of the House Oversight Committee, McBroom said the overall increase in lobbying in Michigan is likely linked to an increase in money in politics because of the state doubling campaign contribution limits in 2013 and to government becoming too influential in people’s lives. The government’s actions affect so many aspects of life that more groups feel lobbying the government is important, McBroom said. “We’ve just allowed government to become too pervasive,” McBroom said. MCFN sent a request for comment to all three of the top lobbying firm for 2016, about the overall spending increase. None of the firms — James H. Karoub Associates, Governmental Consultant Services Inc. and Kelley Cawthorne — responded. In the current climate, even McBroom admits that paying for lobbying is becoming critical for people who want the Legislature to take action on a particular subject. 2015: "Spending On Lobbying Hit Record High In 2015"
2012: "Lobbyists' spending hit record $37.1M in 2012: But lobbyists' reports conceal as much as they reveal"
2011: "Record spending by MI lobbyists in 2011: Recession over in Lansing money-in-politics sector"
2008: "Lobbyists reported spending $32.1M in 2007: Total up by 6% compared to 2006"